About this objectRetirement dinner in the Far Isles for a member of Ullapool Fire Brigade. Attendees were from Ullapool Fire Brigade, Achiltibuie Fire Brigade and the Area Commander and Training Officer who were based at the headquarters of the Northern Area Fire Brigade in Inverness. 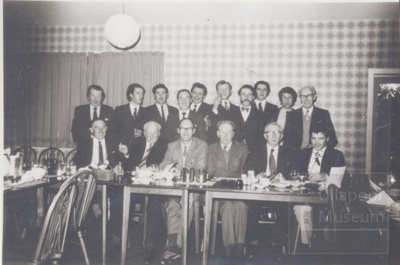 The dinner took place in the now demolished Far Isles Restaurant on North Road, Ullapool in 1976.